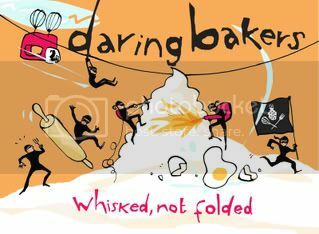 This month's Daring Bakers challenge was chosen by Elle of Feeding My Enthusiasms & Deborah of Taste and Tell. 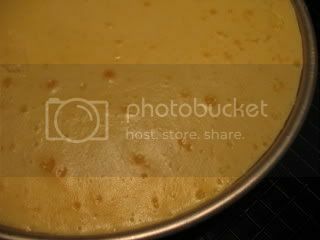 Even though I was excited about this recipe and talked up making it for several weeks, I waited until the last minute to get it done...making the cheesecake Thursday night and putting together the pops Friday evening. Thankfully, my friend Margaret was here Friday to help me finish them up. 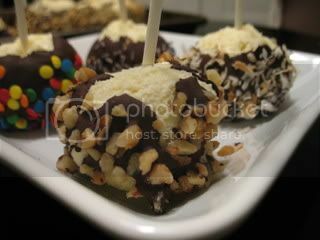 We dipped the frozen cheesecake balls in melted bittersweet chocolate then rolled them in crushed graham crackers, chopped walnuts, toasted coconut, lavender, and candy dots. 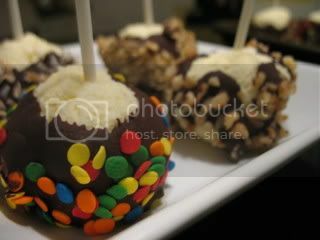 They are very yummy...and fun to make! Oh, and fairly easy, too! 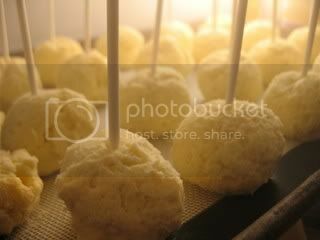 You basically just make a crustless cheesecake, chill it, then roll it into balls, stab 'em with a lollipop stick, freeze, dip, & decorate. These would be great for a birthday party or shower. Nice pops but that is so not last minute. You started on Thursday! In my book that's well thought out and planned ahead! Yum! 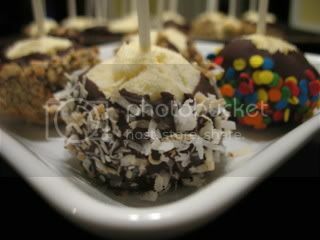 I love the chocolate and coconut! Great job! Hey, we started on the same night! I don't call it procrastination so much as waiting for the perfect moment to apply my techniques! 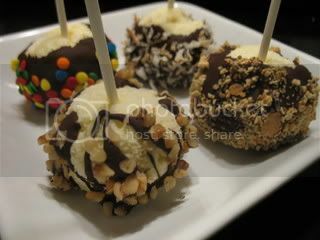 Beautiful pops, by the way, I love the variety in toppings. Oh I love chocolate and coconut! Great job! Great job! You work well under pressure. Beautiful job! I love how they all turned out, different and colorful!! BTW, I am so jealous of your morels! !